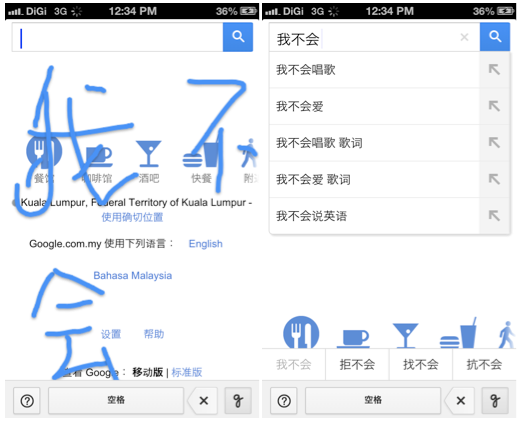 Last year when Google first introduced Handwrite for its mobile search, it served as a great alternate way for you to perform a search on mobile devices, but it was pretty limited back then, especially for Chinese characters. Google recently released an update for the Handwrite feature to make things easier and much quicker – it is smarter at distinguishing the difference between “1”, “l” and “I”, allows you to overlap when writing, and is able to recognize several Chinese characters at one go. First up, the characters “1”, capital “i” or lowercase “L” has always been a major problem, especially for handwriting. When you key in such characters, Google Handwrite will now list out alternative selections for you to pick from so you can quickly make a correction instead of writing out the character again (as shown in the image above). 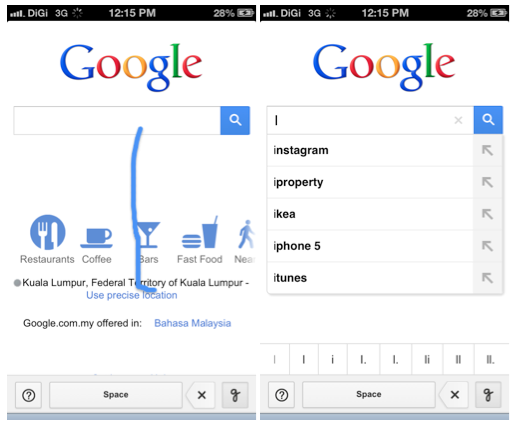 Despite having bigger and bigger displays on your mobile devices and the fact that 5” is becoming a norm, Google thinks that your mobile screen space is too limited so it now allows you to overlap when writing, saving you precious space and allows you to fit in as many words at one go as possible. The recognition process might be slower than if you actually wrote out the words properly but I must say, it’s pretty accurate and impressive; it was able to decipher the gibberish I scribbled out during a test. Finally, the update also allow users to key in several Chinese characters at one go, making it faster and easier to key in your search. Do note that while it’s limited to several characters in a line, if you have several simple characters, you can actually write in multiple lines, just make sure they are far apart enough so Google won’t confuse them with one big Chinese character. 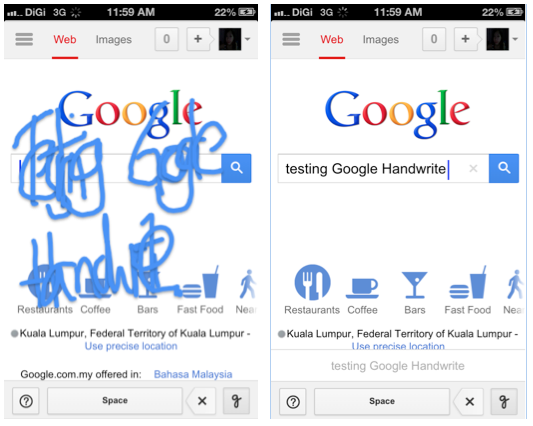 Check out Google Handwrite on your mobile device now; to activate it, visit google.com on your mobile browser, hit Settings and select “Enable” under Handwrite. Save and reload google.com to test out these new features right away.